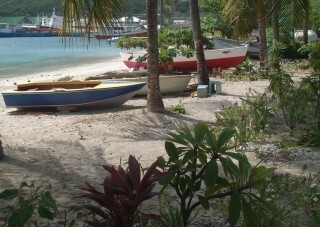 Landscape: A small island off St. Vincent. Lush and green, fairly hilly. 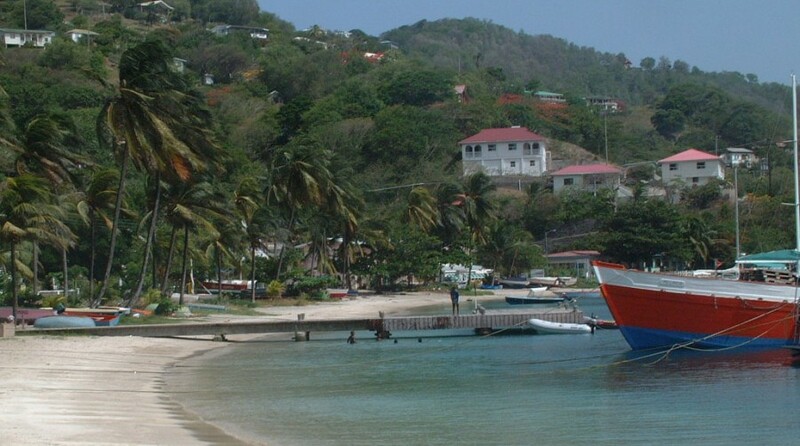 Visited: We spent July 6, 7, and 8 of 2002 in Bequia. Although Bequia is part of St. Vincent, it's history is dissimilar in that there was no agricultural base leading to the importation of slave labor. In fact the early inhabitants were seafaring whalers from America, farmers from Scotland, and freebooters from France. Add Africans to this mix and you've got today's Bequian. The traditions of fishing, whaling and wooden boat building persist to this day. Well, along with a good portion of yacht-oriented tourism. (Sue) Admiralty Bay has long been a hang-out of cruisers, some arriving and not ever leaving. 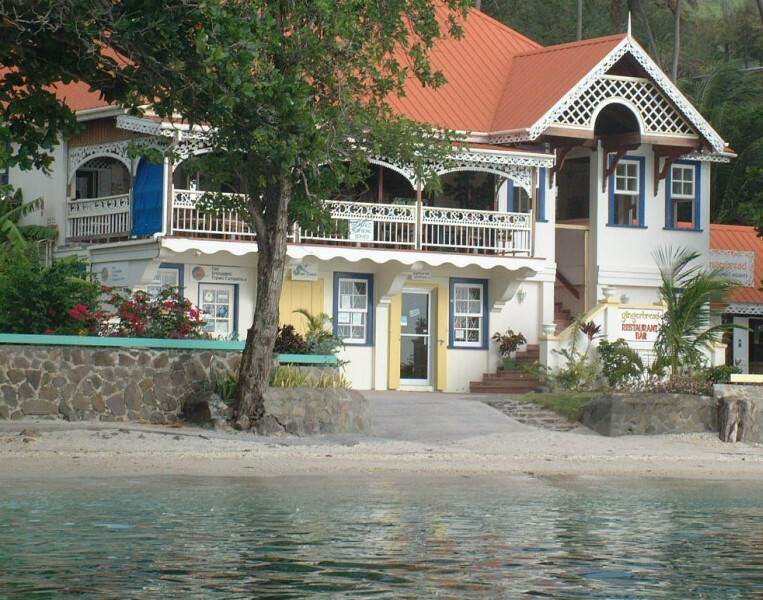 Some have set up businesses ashore like restaurants, dive shops, and boutiques. 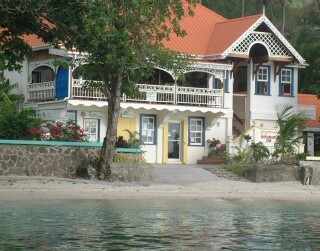 In the 1980's Jon and I never got into the "scene" in Bequia, though it's a lovely island for a stop. This time, as we met cruising friends here with kids, we spent a few days and could have spent longer. The water in the bay was clear and clean and the shore line is a delight to explore. Jon and I took a long hike to the interior and were picked up by a resident in his 4x4 and taken to his home for beers and a great view. We were part way up his VERY windy driveway when we realized just how drunk he was. We declined the offer of a return ride, and hiked the 3 miles back to town! (Jon) Bequia has long been a favorite of cruisers - perhaps too long. It is very picturesque and quaint, but it's also quite crowded, with an "in" group of cruisers who've more or less settled there. I hope it doesn't stifle itself with success. We made our own group with cruising friends on Fruity Fruits and other boats, but we still felt a bit like we were on the outside looking in. Perhaps if we'd had more time, we'd have fit in more. (Chris, age 15) Although we spent little enough time in Bequia, it struck me as a place I would like to visit again. 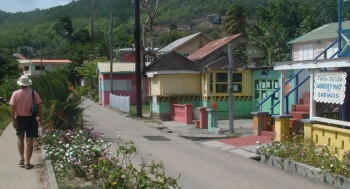 The people there were friendly, and the whole island seemed quite peaceful. It seems to me that it is a quiet, relaxed place. I don't think I would want to stay there too long, but I would like to visit again. The brightly colored buildings, the clear water, the beautiful hills, and the open beaches put me in mind of a perfect 'Caribbean vacation' site for anybody who wants a few days to relax. (Amanda, age 13) I didn't go ashore in Bequia, because we were only there for a few days and it kept raining, but what I most enjoyed there was the swimming. Right next to where we anchored, there was a little white - sand beach. It would have been close enough to swim to, if fishing boats hadn't kept driving way too fast between us and it. One of the days we were there, we had the kids from Fruity Fruits over, to sail Nikka around, and we decided to go over to the beach. This was the day our parents were on shore, so we had to row the dinghy over. It was really nice swimming on a beach again. I wish that we hadn't been hurrying down to get to friends, because then we could have stayed longer there, and I might have had a chance to go ashore without a promise of a rain squall.